As the sun sets behind the big construction site, all the hardworking trucks get ready to say goodnight. One by one, Crane Truck, Cement Mixer, Dump Truck, Bulldozer, and Excavator finish their work and lie down to rest—so they'll be ready for another day of rough and tough construction play! 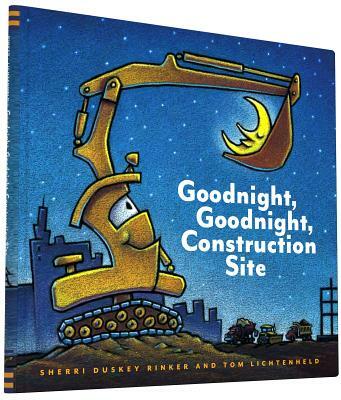 With irresistible artwork by bestselling illustrator Tom Lichtenheld and sweet, rhyming text, this construction book for kids will have truck lovers of all ages begging for more. Can't get enough of these tough trucks? The long-awaited sequel in this bestselling book series, Mighty, Mighty, Construction Site, is now available! Sherri Rinker is a graphic designer and is constantly inspired by the passions of her two young boys. Tom Lichtenheld loves drawing pictures and telling silly stories. His books include the best-selling Duck! Rabbit!, Everything I Know About Cars, and Shark vs. Train. He lives in Geneva, Illinois.